Newly minted Liberal senator and former major general Jim Molan has questioned how Australia's new F-35 Joint Strike Fighters would stack up against Russian fighter jets at the latest Senate estimates. In an exchange with Chief of Defence Air Chief Marshal Mark Binskin, Senator Molan, a former military pilot, put forward a diagram of a scenario where Russian built Su-57 and Su-35S fighter jets confront a fleet of Australian aircraft, likely to include the F-35s, around 800 nautical miles north of Australia. Senator Molan said the diagram, the author of which went unnamed, suggested the Russian jets had better altitude performance and could better sustain supersonic flight without the use of afterburners. "There is an altitude deficiency between what we are buying, the F-35s, and what the person who constructed this diagram believes the Su-57s and 35s have," Senator Molan said of the diagram. "It implies a speed element in that the super cruise of the opposing forces will lessen the ability of missiles and it implies judgment about the impact of missiles." ACM Binskin, a former fighter combat instructor, said while the F-35s would not have the super cruise element, he said the scenario from the diagram was oversimplified. "Is there a relevance in a deficiency between height capabilities?" ACM Binskin said. "Is there any truth in that? I mean, if you have an aircraft that can go up higher and faster, some would say it just runs into your missile quicker, but that is being overly simplistic." ACM Binskin added that the scenario presented also included too many "what ifs", and wrongly indicates that the F-35 aircraft could only reach 35,000 feet. "Does the F-35 have super cruise? No, it doesn’t. Does it have better radar cross-section? Yes, it does ... it might not be up there at that height and speed, but it’s going to get earlier detections to be able to employ its weapon," he said. 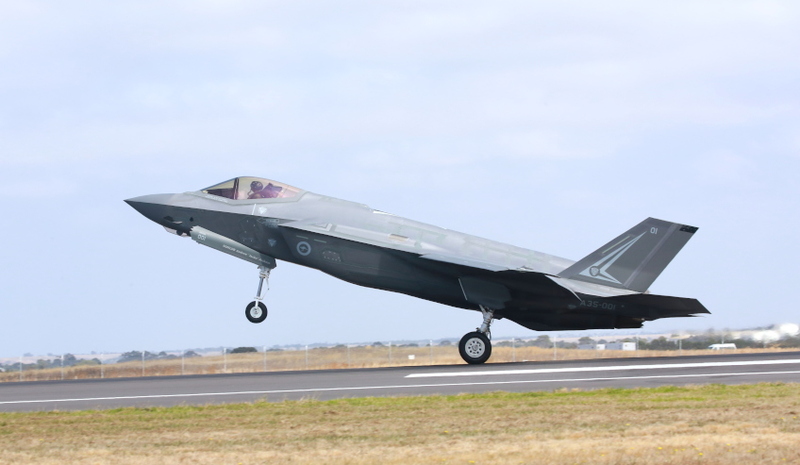 The first two of 72 Australian F-35A aircraft are scheduled to arrive for permanent basing at RAAF Base Williamtown, NSW, in December this year. By the time of final operating capability, expected in December 2023, Australia will have a training squadron and three operational squadrons comprising 72 aircraft to replace the F/A-18 Classic Hornet at a cost of $17 billion. Currently, three aircraft are undergoing testing and training operations in the US.